A fully guided 4 day Paris tour over the Christmas holidays, with an optional day trip to Disneyland® Resort Paris for the Christmas parade. Take a cruise on the river Seine, see the Eiffel Tower in Xmas lights, christmas shopping on the Champs Elysées, see the Arc de Triomphe, visit Montmartre and the Moulin Rouge (the home of the cancan) see the Cathedral of Notre Dame and explore the Louvre Museum! 3 nights bed and breakfast in the 3 star All Seasons Paris Bercy. Accommodated in twin/double bedded rooms. We start our 4 day tour on Christmas Eve from your chosen UK departure point. We travel to Paris by modern executive coach with one of our friendly drivers and our experienced Paris guide. Our journey includes a short sea crossing, from where you can usually see the famous White Cliffs and Dover Castle, as we sail towards France. On arrival in Paris our driver will take us directly to our 3 star hotel right in the centre of Paris for check in, followed by a coach sightseeing tour (with photo stops) to see this stunning city in Christmas lights. In the evening the guide will accompany the group on a night out to experience Christmas Eve in one of the worlds greatest cities. After breakfast, meet the guide at 9am for a full day of sightseeing on Christmas Day. 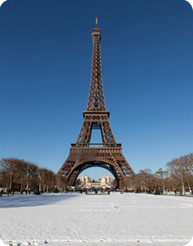 A truly amazing way to spend Christmas day - climb the Eiffel Tower, visit the Moulin Rouge, cruise the River Seine!! Our first stop is Montmartre for the Sacre Coeur, Place du Tertre and Moulin Rouge. Then on to Ille de la Cite and the world famous Notre Dame Cathedral, with time for lunch on the banks of the Seine. In the afternoon we take a boat cruise on the River Seine and a visit to the Eiffel Tower! See the Tower in Xmas lights. Group Xmas Dinner - 3 course meal evening meal with wine for £39 per person. Celebrate Christmas with your fellow travellers! A day in Paris for sightseeing & shopping. Walk along the Champs Elysees, visit the famous departments stores at Opera, visit the world famous Louvre museum for your chance to see the Mona Lisa, the Venus de Milo, Michelangelo's Dying Slave or to follow the Da Vinci Code! Optional extra - Alternatively take a full day trip to the world famous Disneyland® Resort Paris (£89 extra); a fairytale Christmas. Option - Half day trip to the Palace & Gardens of Versailles - £45 (09:00-13:00) - A fully guided half day coach tour to the stunning Palace & Gardens of Versailles. Built in the 17th century during the reign of Louis XIV to project the absolute power of the French monarchy, it served as the political capital and royal court for over 100 hundred years, until in 1789 the revolutionary mobs massacred the Palace Guard and dragged Louis XVI and Marie-Antoinette to Paris to cut off their heads! Undoubtedly the grandest and most famous chateau in France. Price includes coach and entry to the Palace. We meet the rest of the group in Paris after lunch and depart for Calais, arriving back in Dover early evening 19:30-20:00, Kent drop offs between 20:00-20:30, in London 21:00-21:45 and Cambridge by 23:00/23:30. On the final day, this tour normally ends by 10pm in London, or 9pm in Canterbury/Ramsgate. If you are travelling onwards to Cambridge the final arrival time will vary, as the feeder service that we provide links in with our other tours. If we are unable to transfer you by our own transportation, we will provide free rail or coach transfers to Cambridge. In the event that public transport (rail or coach) does not offer a practical and convenient service, International Friends will provide travel by taxi, minibus or coach. Your bags will be stored in the locker compartment on your bus and each person can bring maximum of two suitcases. All of the touring and sightseeing mentioed in the itinerary is incuded in the cost of the tour. Travel during your free time is not. We reccommend Travel by metro for which you can buy a 'carnet' of metro tickets. This allows 10 journeys in Paris by metro, and costs approximately £12. Your guide will assist you when buying the carnet in Paris.